Teams that go up 3-0 in an NHL playoff series are now 113-69 in Game 4s. What else can you say about a sweep? The Wild made it interesting, finally solving Corey Crawford with two goals in the waning minutes, but ultimately the Blackhawks prevailed with a 4-3 victory. Perhaps we shouldn’t have been surprised, at least after Game 3. Teams that go up 3-0 in an NHL playoff series are now 113-69 in Game 4s. And the Wild failed to become the fifth team out of 181 to come all the way back and win a series after trailing 3-0. 0: Yes, that’s not just the number of wins the Wild had. That’s the number of minutes Minnesota even held a lead in the series. That’s flat-out embarrassing. As you’ll note on the chart, the Blackhawks were playing with the lead more than 70 percent of the time in this series, while the rest of the time it was tied. Against a Chicago team that has not lost this season when leading after two periods, that was a particular recipe for disaster. Goalies: If there was one distinct area of advantage for the Wild coming into this series, it was at goaltender. Devan Dubnyk was a revelation after being acquired at midseason, so much so that he’s a finalist for the Vezina Trophy. Corey Crawfod? Meh, a decent regular season but he was lit up against Nashville and always seems vulnerable (except against the Wild, but this year was going to be different!). It wasn’t different. In fact, Crawford won the goalie battle handily. 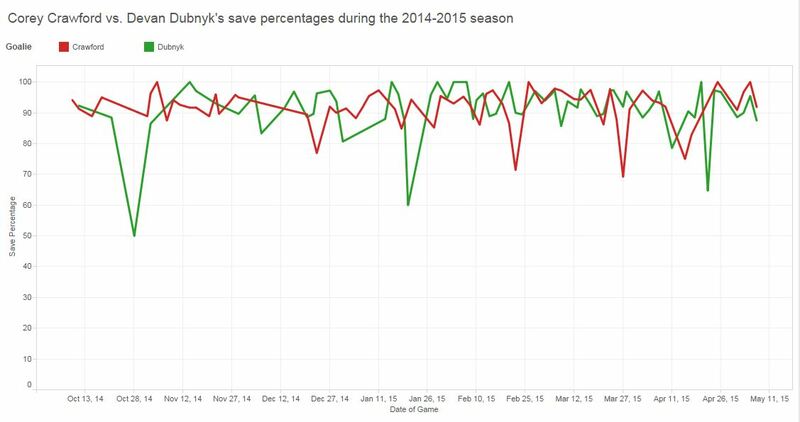 Dubnyk made 100 saves on 111 shots for a 90.1 save percentage. Crawford made 124 saves on 131 shots for a 94.7 save percentage, a number that would have been even better if not for those late goals Thursday. Ryan Suter: If you’re looking to blame Suter, well … don’t. He had an awful Game 2, but overall he had some much better moments in the series than people might realize. In Game 4, his Corsi rating was a plus-20, meaning he was on the ice for 20 more shots for the Wild (blocked, missed the net or on net) than he was for shots against the Wild. That’s a crazy number (Matt Dumba, it should be noted, was also a plus-20 for the night). Simply put: Suter was doing his job for the most part in Games 1, 3 and 4, as Corsi-by-game chart illustrates. He can only do so much when it comes to the puck going in the net. That’s little consolation, though, for a series that didn’t go the way most might have predicted. The final number is sobering: 12 Chicago wins, 3 Wild wins in the last three playoff series over the past three seasons. Minnesota will need to find a way to get over that hump. Coach Mike Yeo said the Wild is a good team that is looking to become the best team. It is not there yet. What terrible promotion will the Cavaliers think of next?